The pace at which hurricanes move across the planet is slowing, according to new research. This suggests Hurricane Harvey, which stalled over Texas last summer, may not have been an anomaly, and that highly destructive, slow-moving tropical storms are becoming more common. The reason Hurricane Harvey was so bad? It got stuck. Harvey dumped more than 50 inches of rain on Houston and its surrounding areas in the five days it spent loitering over the area. Some places received as much as two feet of rain in two days. Around 90 people were killed in Southeast Texas, and over 200,000 homes and business were ruined. In addition to being the wettest tropical storm to ever hit the United States, it matched Hurricane Katrina in terms of cost, inflicting some $126 billion in economic losses. James Kossin, a scientist at NOAA National Centers for Environmental Information in Madison, Wisconsin, says Harvey’s slow pace may be symptomatic of a troubling larger trend. His new paper, published today in Nature, provides evidence showing that the speed at which hurricanes move across the planet, a phenomenon known as translation speed, is slowing. And we’re not talking about minuscule amounts; his data shows that, on average, hurricanes around the globe have slowed by about 10 percent over the past seven decades. 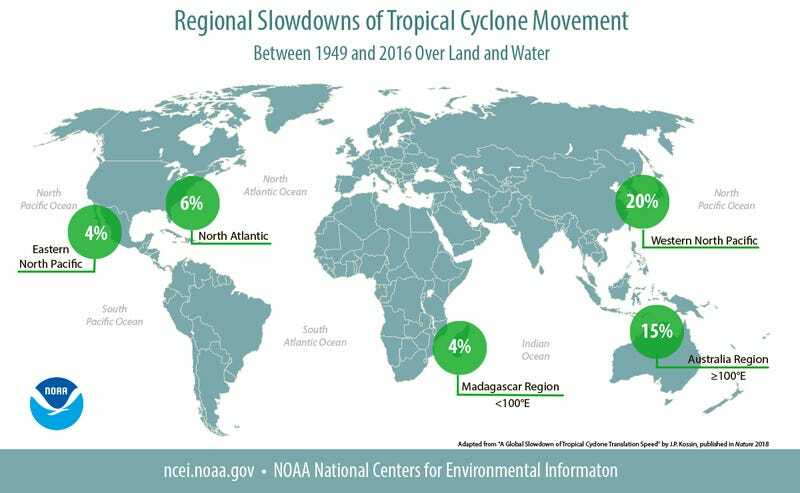 Looking at historic hurricane data from 1949 to 2016, Kossin found that tropical cyclones in the North Atlantic have slowed down by six percent over the period observed. In the Eastern North Pacific and the Madagascar region, it was closer to four percent, but Australian waters have witnessed slowdowns amounting to 15 percent, and in the Western North Pacific the decrease in translation speed was down a whopping 20 percent. Tropical cyclones have slowed in both hemispheres and in every ocean except the North Indian Ocean, according to the new research, but the effect is more pronounced in the northern hemisphere. Of particular concern was the observation that the slowdown effect gets worse when hurricanes reach land, allowing more time for precipitation to fall over a given area. Statistically significant slowdowns of 20 to 30 percent were documented over land regions next to the western North Pacific Ocean, the North Atlantic Ocean, and around Australia. As Harvey demonstrated, “stalled” hurricanes produce more storm-related damage, particularly flooding. “These trends are almost certainly increasing local rainfall totals and freshwater flooding, which is associated with very high mortality risk,” said Kossin in a press release. The reason for the global slowdown, says Kossin, may have something to do with changes to the steering winds that regulate the direction and speed of tropical storms. He fears that global warming is changing — and weakening—the way air circulates within the atmosphere, an effect that many other studies have found. Climate change is already considered a factor for increasing the severity of the strongest tropical cyclones, and a warming world is also leading to greater rates of precipitation. There’s now added potential for a double-whammy effect with the arrival of slower tropical storms. Writing in an accompanying Nature News and Views article, Berkeley climatologist Christina Patricola says one limitation of the study is that it doesn’t fully explain what’s going on with the rate of tropical cyclone rainfall.